The 3D Vision IR Emitter stereo controller driver wont install. When connecting the 3D Vision IR emitter for the first time you are prompted with the "Found New Hardware dialog." 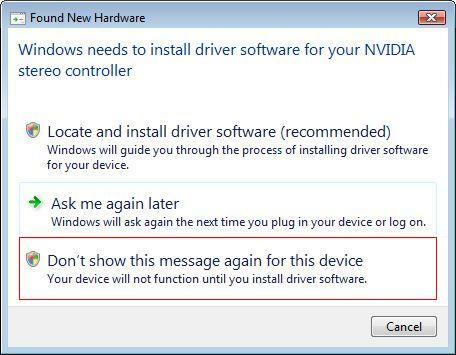 If you click, "Don't show this message again for this device" when connecting NVIDIA USB IR Emitter it will not install when you run the 3D Vision installation CD-ROM for this device. You must install the USB driver manually through Windows Device Manager. 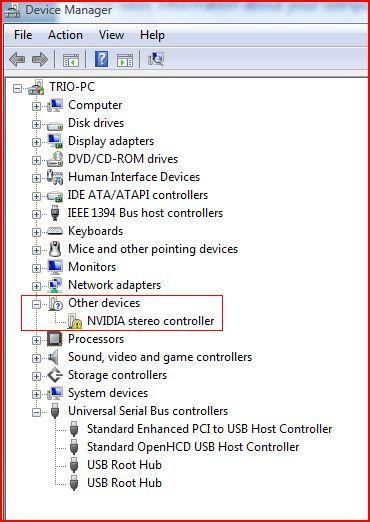 Right click on the NVIDIA Stereo Controller and select Update Driver Software. You will be presented with the following message. 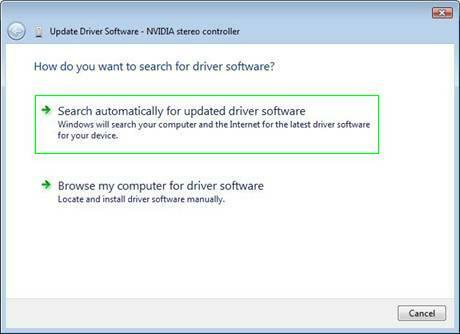 Select Search automatically for update driver software and the driver will be found and installed.